In order to wake up early and have one last day of actual productiveness before our Spring Break I needed a breakfast that would jump-start my brain! 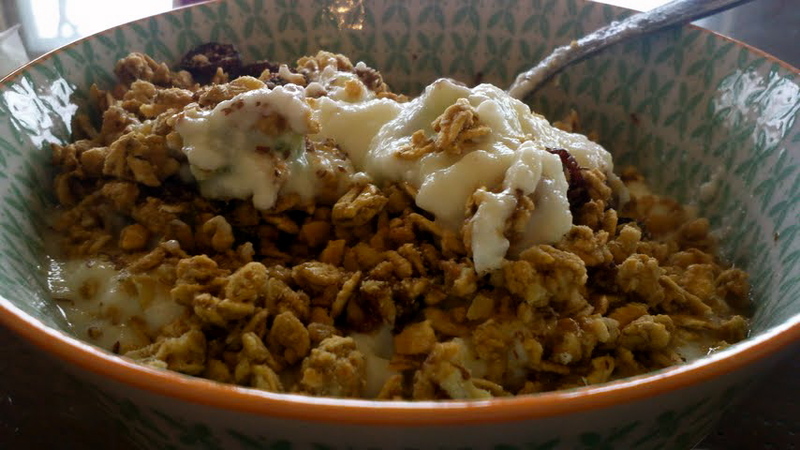 My favorite is plain fat-free yogurt, packed with probiotics, combined with kiwi chunks, granola and ground flaxseed. The yogurt is perfect for your digestive system, especially if it is the first thing you are eating in the AM. For first timers to plain yogurt I definitely suggest Stoneyfield Farms, the company produces all organic products and do their best to help sustain our environment. Kiwi’s have large doses of vitamin C and beta-carotenes which help boost your immune system and fight off nasty colds. One a day is supposed to help keep you cold free all winter!! 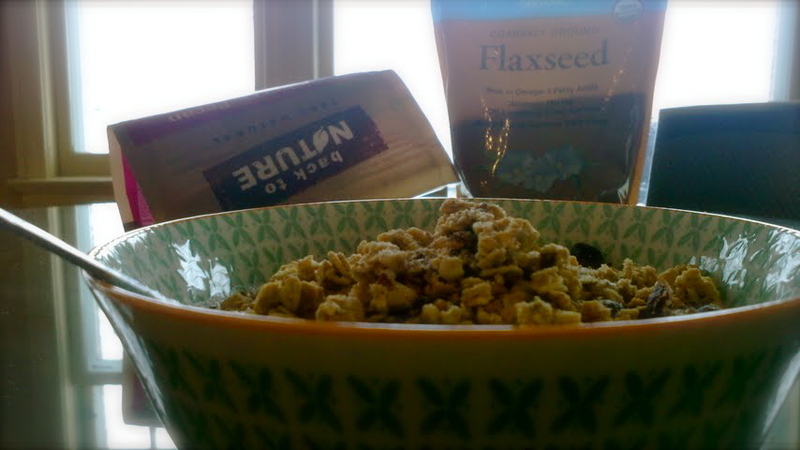 The granola, Back to Nature, is also USDA organic and sweetened with natural sweeteners and fruit juices. The flax adds some fiber and makes this a complete and balanced meal, way better than refined sugar that tastes like cardboard, a.k.a cereal! Wake up to a bowl of natural energy, Bon Appetit. On my way to an interview I passed Gail Ambrosius and all I saw from my car was Dark Chocolate in big cursive letters enticing me to stop and check it out. 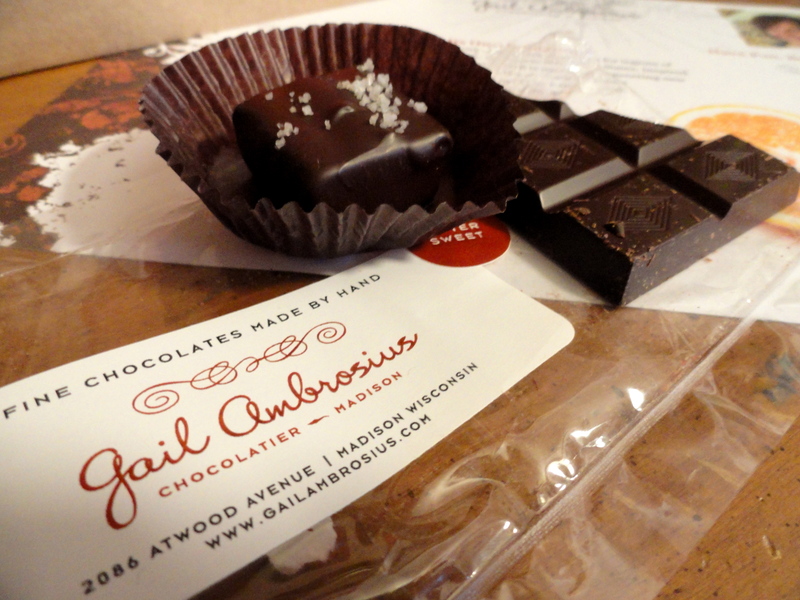 So very glad I did because I arrived home with a bitter-sweet chocolate bar and a staff favorite Sea-Salt Caramel dipped in dark chocolate. Unfortunately I devoured the chocolate bar in about 20 minutes but am forcing myself to save the caramel. I snapped some pictures to make mouths water and can’t wait to return again, very soon. Candinas, TerraSource Chocolates (Vegan), David Bacco Chocolats (DB Infusions) and hopefully so many more. Bon Appetit and take time to indulge in what you love. This is a special happy birthday and cheers to one of my very favorites, Mose! Last night was her 21st birthday and since we are now entering the “real world” (of legal drinking) we decided to act like it and treat ourselves to Graze. 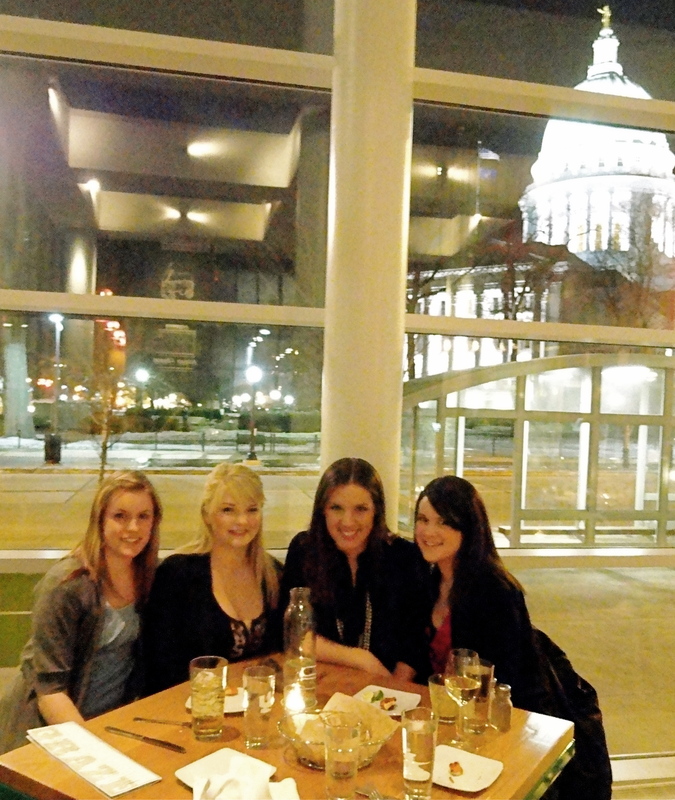 This is Chef Tory Miller’s latest addition to Madison’s downtown Capitol Square scene and it is definitely one that will last. This was supposed to be Mose’s birthday treat but I think my ooing and awing over every bite left me definitely the most satisfied. The gastropub menu and unique, hip atmosphere allowed us to forget we were only a few blocks from campus, so we choose to start with some fancy cocktails and sweet wines. 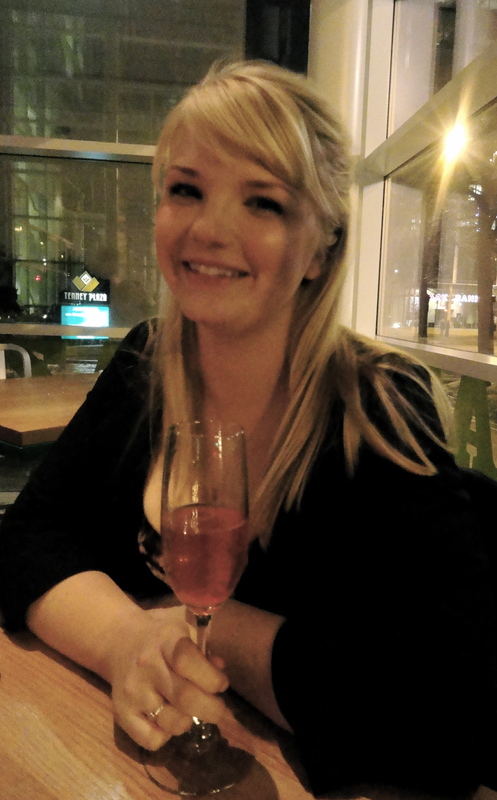 The birthday girl ordered a classic Cider and moved on to a Raspberry Sprinkler. This colorful drink of raspberry purée, Mathilde Framboise and sparkling wine was fit for a princess. There were also some Rhum Fires, a unique mix of gingseng-star anise infused rhum and ginger beer (definitely a bit experimental) and classic white wine ordered, and all of course consumed by those of age while the rest of us drooled waiting for our day when we can explore a cocktail menu. Next we decided to start with an appetizer and this was easily, hands down, the best decision we made all night. 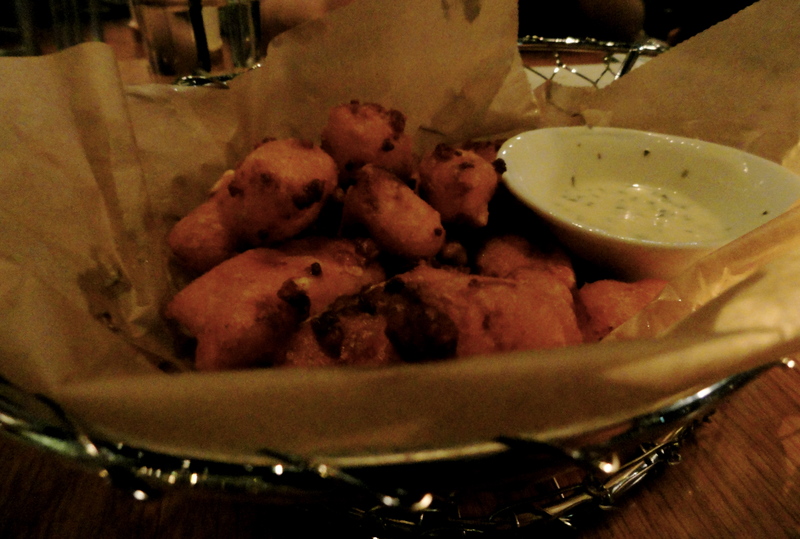 The Fried Sassy Cow cheese curds made in a vodka batter and served with house ranch are something I will never forget. The thin layer of batter melted away in your mouth while endless amounts of cheese oozed out. The first few bites left us all a little speechless and so far all was oh-so-good. 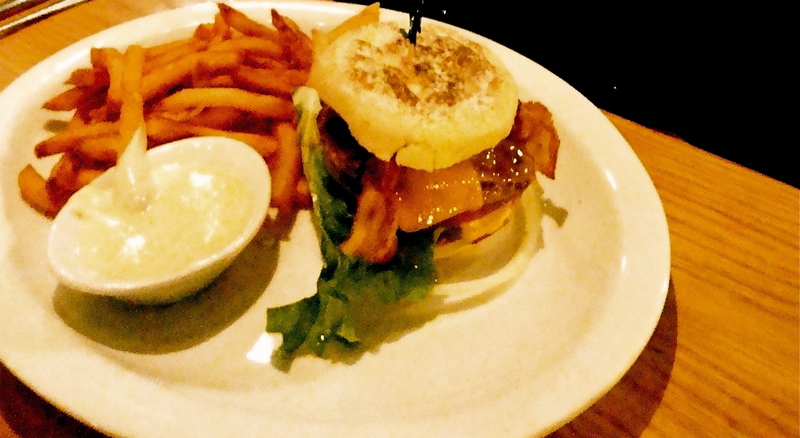 Our great friend and Madison Chef, Ian Gatley, recommended the Pub Burger which is a pasture Highland beef patty sandwiched between two housemade English muffins and the works; including housemade pickles, bacon and aged cheddar cheese. The crispy fries were served with a garlicky aoli sauce to show off how amazing this burger was in comparison to any other attempts out there. 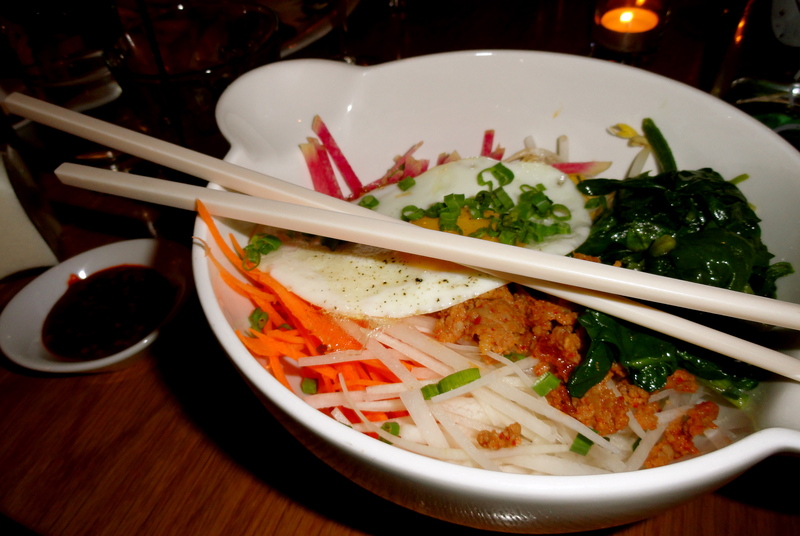 Three of us couldn’t help but order that while I sampled the Bibimbap; a bowl of crispy rice, marinated ground pork, sautéed spinach, winter vegetables, bean sprouts, sunny-side up egg and a spicy gochujang sauce. The idea is to mash everything together and enjoy with chop sticks. This indeed was like nothing I have experienced for dinner because of the mixture of meat, veggies and eggs but my taste buds were far from disappointed. Even though by now we were all coming close to food comma we pushed through and ordered desert and were so grateful that we did! Mose, our birthday girl, choose the Hot Fudge Sundae which was a combination of their homemade vanilla ice cream, whiskey caramel, whipped cream and smokey chopped hickory nuts. We sang happy birthday and gave cheers to a new year and our one missing love who is abroad in Paris. Food and birthdays have become two of my favorite things over the years and we can all enjoy and celebrate the festivities. Bon Appetit and Cheers to you.